Naturally, my mentions on Twitter were quickly overrun by, well, a veritable army of sockpuppet accounts all spouting identical rhetoric and posting identical memes in order to prove that I’m a soulless, robotic “Non-Player Character.”. After my post was retweeted by Paul Joseph Watson, the Boy Wonder of Infowars, the NPC meme sockpuppets were joined by an assortment of other far-right trolls. Their message? Aside from a few who insisted I had failed to properly appreciate the glorious humor of their “parady “accounts, most responded with variations of the classic argument beloved by five-year-olds: No, u! By noticing their meme campaign, they declared in unison, I had proven that I was the real NPC. Some had slightly more sophisticated arguments than “no, u.” Some of them insisted that the fact that I was just so darn mad about the NPC memes proved that I was a soulless NPC. Yes, they are seriously claiming that the fact that I have emotions means that I’m a robot, because of course robots are so well-known for *looks at notes again* having strong feelings about things. 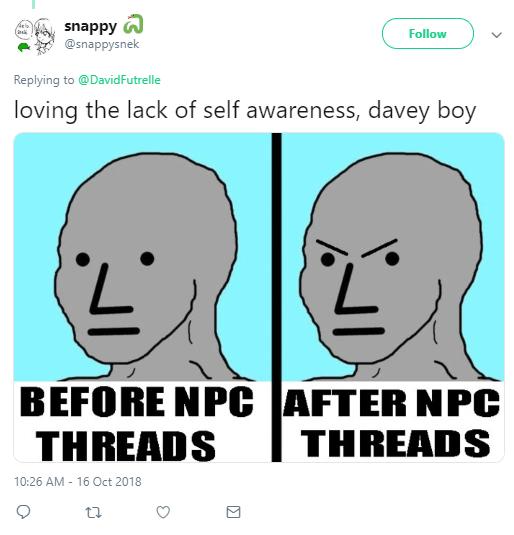 That said, my post about the NPC meme army wasn’t an angry one; I was, rather, a bit bemused that so many trolls were throwing themselves so enthusiastically into a meme campaign that was such an obvious self-own, revealing them, not the SJWs they were trying so ineptly to “parady,” to be the most prone to robotically repeating the same jokes, the same memes, the same accusations, over and over and over again, many of them using sockpuppet accounts created just for that purpose. 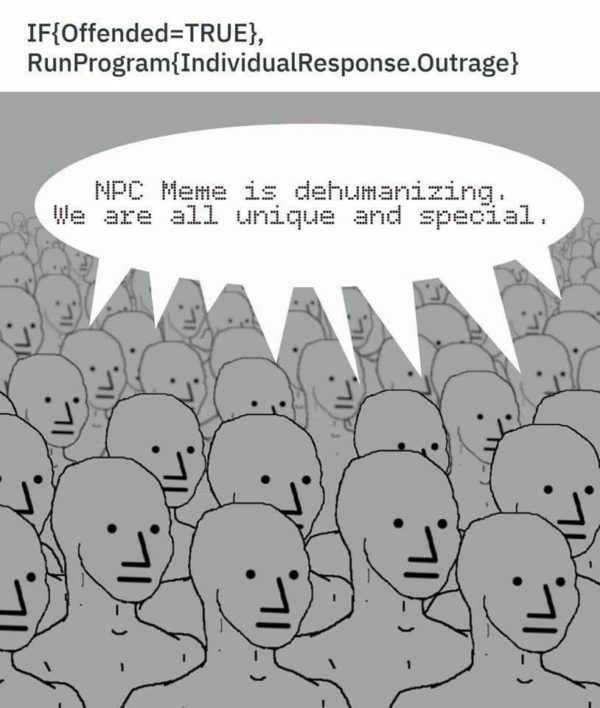 The one aspect of the NPC meme that does make me a bit angry, and more than a bit sad, is its dehumanizing nature. As I noted in my first post on the subject, the person who got the meme going in the first place was a 4chan anon who argued, in all seriousness, that those he disagrees with have no souls. As I pointed out in a tweet, this kind of dehumanizing rhetoric has historically been used to justify violence — up to an including literal genocide — towards those deemed less than human. Needless to say, the independent-minded thinkers who mock so-called SJWs for taking offense at their dehumanizing meme get quite offended if you suggest that they might be acting a bit robotically. Indeed, many of them seem to be nursing deep grudges at all those who may have accused them of being Russian bots — or who have simply noted that many of their favorite meme campaigns have gotten the support of actual, honest-to-goodness Russian bots. There are so many of these guys that when I tried to fit a bunch of them in a single screenshot I ended up with this blurry, glitchy mess. The reddest and maddest of the Russian-bot-complainers was probably this guy. Do they have a little bit of a point here? 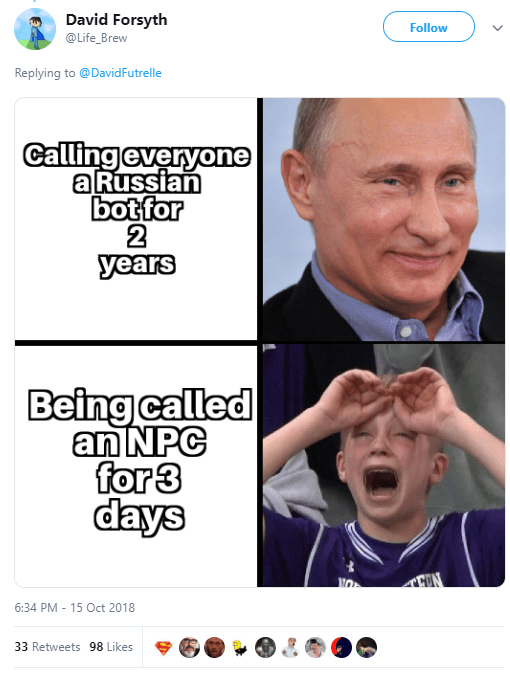 Is being called a Russian bot equivalent to being called an NPC? Here’s the thing. NPCs don’t exist, at least not outside of tabletop and video games. The meme — which, as I said, was invented by someone who literally thinks his opponents don;t have souls — is intended to suggest that actual human beings are somehow less than humans. Russian bots, on the other hand, are very much real and used to create all sorts of shenanigans on the internet, often with the help of paid Russian trolls, who are also a real thing. Numerous detailed studies have shown that Russian bots (and Russian trolls connected to an entity called the Internet Research Agency) have been involved in all sorts of social media campaigns in an attempt to influence political discussions and sow discord generally. Russian bots may have been responsible for the disastrous victories of Trump and Brexit. They’ve pushed anti-vaccine propaganda on Twitter, exploited the death of college student Mollie Tibbits to divert attention from the legal woes of former Trump pals Paul Manafort and Michael Cohen, and helped to sharpen political divisions generally. 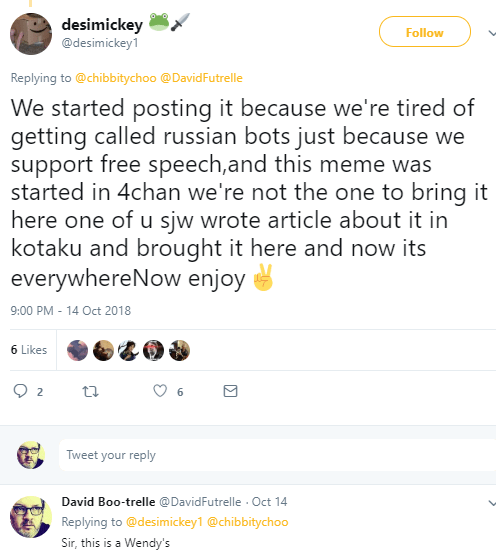 These Russian bots and trolls have something of a symbiotic relation with right-wingers and channer shitposters generally — amplifying the complaints of both groups and having their own disinformation campaigns assisted by both groups in return. It’s true that some liberals area bit too quick to cry “bot” when faced with right-wing Twitter trolls who are more likely assholes of the human variety. But when people call right-wing trolls “bots” they aren’t saying that the people who disagree with them are less than human, They’re suggesting that certain twitter accounts are so predictable and unimaginative and repetitive that they might just be Russian bots. Given that thousands of accounts like these have in the past been unmasked as actual Russian bots, it’s really not an unjustified accusation at all. But I’m not going to accuse any of those who descended upon my post of being literal bots, though for all I know some of them might be. I’m going to pay them the great compliment of treating them as human beings — albeit some of the shittiest and most pathetic human beings on planet earth, the sort of people who make me sometimes wonder if maybe the inevitable robot takeover of planet earth might turn out to be, well, something of an upgrade. We Hunted the Mammoth, which is not written by robots, relies entirely on readers like you for its survival. If you appreciate our work, please send a few bucks our way! Thanks! So far, I’m convinced that the Constitution can be interpreted in a politically progressive way to meet the needs of 2018 and beyond. Of course, the framers, for all their flaws, would be appalled by corporate personhood. Yet, the originalists would never dream of overturning that. Never mind that the constitution says nothing about the subject. 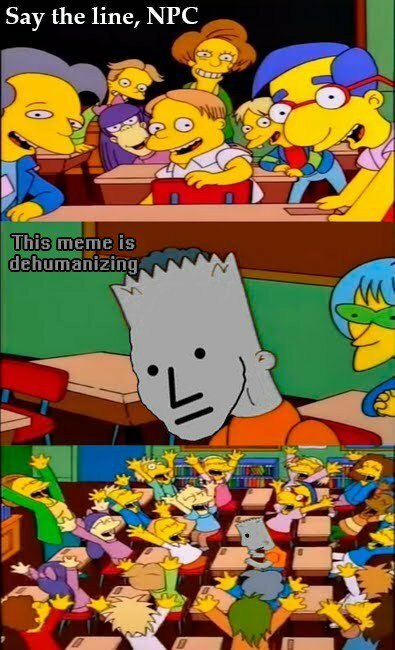 So, basically this ridiculous NPC meme grows out of them realizing they’re outnumbered by normal people. – Light Blue for the Bloc Quebecois, the Quebec ‘separatist’ party that has more recently fallen on hard times. There are lots of minor parties as well, such as the Libertarians, Christian Heritage, Marxist-Leninist, and the perpetual joke contenders of the Rhinoceros party (who promise never to follow through on any of their promises). None of the minor parties got more than 40,000 votes in the last election, and none of them had candidates in more than a quarter of the ridings. According to https://en.wikipedia.org/wiki/Canadian_federal_election,_2015 they generally all have their own colours, but aside from the big five, nobody really cares. And even the ‘big five’ is really the ‘big three’, as the Bloc Quebecois only runs in Quebec, and the Green Party has never had more than two Members of Parliament at a time (and that two was the result of somebody splitting from the NDP and joining the Greens later). Good points. However, I am a fan of the ‘drop the logic bomb and run before it goes off’ method of dealing with trolls and/or idiots. I am just a bit too easily furious and like to get away feeling like I win. And win I do! You wouldn’t believe the monolithic diatribes written to me on the youtube comment sections. I happily ignore them all. And my posts usually consist of a single sentence. Full of win! Not just for conservatives and alt wrongers! Yikes, I was wrong. I’d heard it said before that the parties switched when the Dixiecrats left in the sixties, but it looks like it was a lot more complicated than that. I just think of how Republicans say they’re not racist because Lincoln was a Republican, but Lincoln was progressive for his time. Conservatives don’t get that ideologies are more complex than labels. At least…I think Lincoln was the progressive one? I don’t actually know anything about who he ran against. I need to read up on this history. People are made of ticky-tacky and all look just the same. Malvina, your mommy must be so proud. Unless you think she’s an NPC like all the other ticky-tacky people. Ticky tacky was the early 60’s equivalent of NPC. I know the npc memers’ lack of any figure-drawing ability whatsoever is only the most minor of points at this juncture, but … it creeps me out visually that the “chad” figure in their drawing has its arse and chest facing the same way. This thing of theirs has no spine, literally as well as metaphorically. The “NPC” meme isn’t even new for them, because it’s effectively the same message as “virtue signalling” – everyone outside of my group doesn’t have true consciousness. I don’t want to be on the internet anymore. I know this was a while ago so you might not ever see this response, but the guy Lincoln ran against was Stephen A. Douglas, and he was nowhere near as a progressive as Lincoln. He wanted slavery to be legal in all the western states as well*. *Black slavery. Slavery of Native Americans was completely legal already. Well, you know what they say about Russian bot accusations: If it annoys you, it applies to you. Can these guys even spell?